How Much Floor Does 45 Square Feet Cover? Calculating the dimension of a floor from its square footage is straightforward. It just involves some basic mathematics and a calculator. Different shapes of floor space can have the same area. 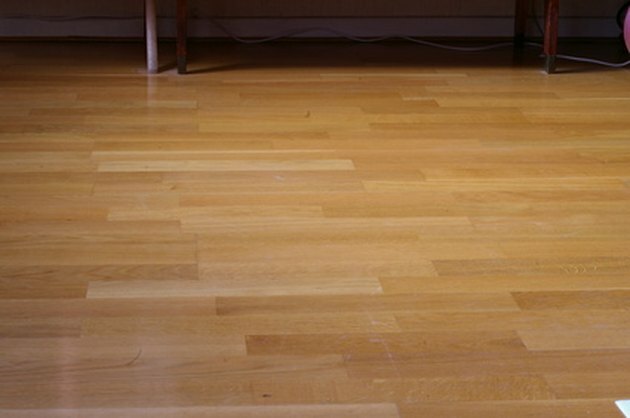 Use basic mathematics to calculate flooring needs. 45 square feet covers a floor space that is 9 feet by 5 feet. It also covers rectangular spaces of 10 feet by 4.5 feet, 20 feet by 2.25 feet and 8 feet by 5.625 feet. There are also 45 square feet in a circle with a radius of 3.8 feet. A right-angle triangle of 9 feet by 10 feet also has an area of 45 square feet. To find the dimensions of a floor space from its square footage, find two numbers which multiply together to give the square footage number. Calculate square footage by multiplying the width of the floor space, in feet, by the length of the space, also in feet. For example, a space of 10 feet by 5 feet has an area of 50 square feet. The total area of different shapes can also add up to 45 square feet. For example, a square floor shape of 5 feet by 5 feet has an area of 25 square feet. Adding this to a rectangular floor shape of 5 feet by 4 feet gives a total of 45 square feet.